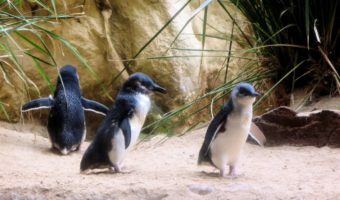 The Little Penguin is the smallest species of penguin and breeds around the entire coastline of New Zealand and the Chatham Islands as well as southern Australia and Tasmania. These penguins have several common names. In Australia they are often referred to as Fairy Penguins due to their small size, in New Zealand they are called Little Blue Penguins or just Blue Penguins owing to their plumage colour, the New Zealand Maori call them Korora. 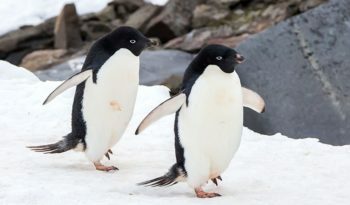 There are two sub-species recognized: the Little, or Fairy penguin and the White-flippered penguin. Little Penguins are the smallest of all the penguins standing only 16 to 17 inches tall (41 to 44 centimetres) and weighing only about 2 pounds (1 kilogram). 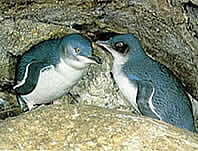 Little penguins are also called ‘Little Blues’ because of the indigo-blue and slate-grey colour of their feathers. The White-flippered penguins are distinguished by having a white stripe around the edges of their flippers. Most of their food is caught on shallow dives to depths less than 30 feet but they will sometimes dive to the seabed in search of prey species. Little penguins eat small fish such as anchovies, squid, plankton, krill, small octopus and pilchards. From the sea floor, little penguins may eat crab larvae, sea horses and crustaceans. Like most penguins, they swallow their food whole. Little penguins spend their days out at sea hunting for food in the shallow waters close to the shore. They can often be seen congregating in groups, referred to as ‘rafts’. At dusk, Little penguins return to their burrows or rock crevice colonies, which can be quite noisy especially before their pre-dawn departure back to sea to feed. Since they feed so near to shore they are easy to see from land. Female Little penguins arrive in June to the breeding colonies and are met by raucous males who perform complicated courting displays. Peak egg laying time is generally June through August. 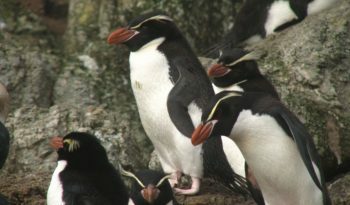 They lay two eggs at a time which take approximately five weeks to hatch depending on the availability of food supplies. 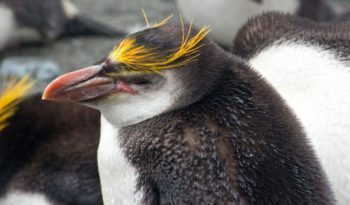 Little penguins may have one, two, or even three broods (clutches) in a season. Nests are usually located in sheltered rock crevices but where these are not available they dig long burrows instead. 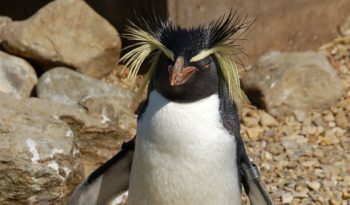 Most Little penguins mate for life with both males and females incubating the eggs and caring for the young. Throughout their first three weeks the chicks are attended to constantly. Over the next five weeks adults visit them only to feed them regurgitated food. After this period, the young fledglings are then forced from the nest. Little penguin chicks naturally know how to swim and are able to fish and fend for themselves. 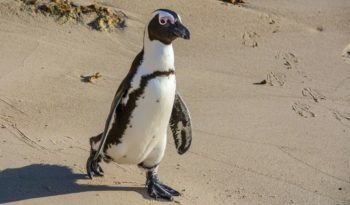 Little penguins face predators at sea such as sharks, seals (Lion, Leopard, and Fur), Killer whales and predators on land such as Sea Eagles and large Gulls. Man-made hazards include oil spills, plastic, road kills, gill net fishing and loss of breeding habitats. 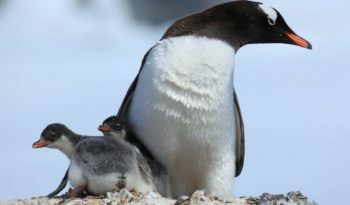 Whilst not endangered as a whole, Little penguin colonies in areas with significant human activity are under some threat from pollution and feral animals. In Australia they were once common along the southern coast line but the introduction of domestic cats has dramatically reduced their viable habitat. They are now primarily restricted to cat free islands off the coast.